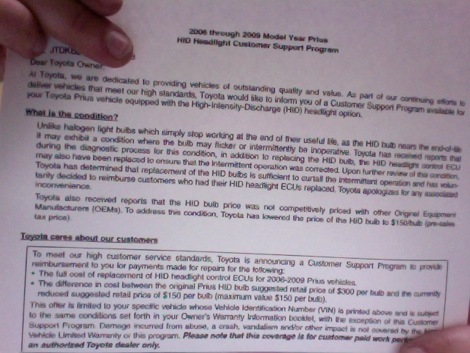 Owners of 2006-2009 Toyota Prius equipped with HID (high intensity discharge) headlights will receive an apology letter from Toyota this month, in response to their overpriced parts and/or incompetence. Toyota has reduced the price of the bulbs to $150 from $300, and will reimburse anyone the difference who paid more than $150 for one. They will also reimburse you for any charges incurred to replace the headlight control computer (ECU) in case a dealer technician misdiagnosed the problem. If you had your bulbs replaced here, at Luscious Garage, you are not eligible for this reimbursement because we have always charged around $100 per bulb, which is less than Toyota charges even after this good will campaign. 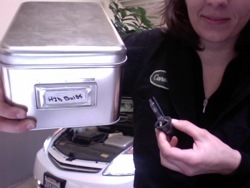 Yes, ours are OE Philips D4R XenEco brand, the exact same as Toyota sells. Current price is $94. 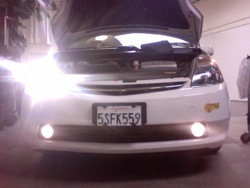 And no, we have never sold a Headlight ECU. Why would we? It’s common knowledge that the problem is just the bulbs. But what of the installation price, which is repeatedly quoted at $250-$300, allegedly to “pull the front clip” (front bumper) to access the bulbs? The Toyota letter mentions nothing of that crooked sales pitch. As I have said to many customers here in person, if the dealer technicians are actually pulling the bumper to replace the bulbs, they are idiots. I am quite sure they are not, rather replacing the bulbs from above (which is what we do, which takes 10 minutes or so), which only makes them crooks. But I would rather have a crook working on my car than an idiot. Needless to say, here at LG, you don’t have to deal with crooks or idiots. We continue to charge $30 for installation per bulb. Price of bulb, install, and tax, out the door, is $132.93.